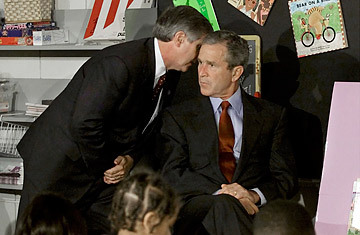 When the children's story was done, Bush left for the school's library, where he discussed the New York City, Washington and Pennsylvania nightmare with aides, reporters and another group of students waiting for him. Back in the classroom, Daniels brought in a television and turned on the first bewildering images of the Twin Towers in flames and smoke. At that point, the kids started connecting the dots. "It was pretty scary," says Williams, "and I remember thinking, So that's why the President looked so mad." Dubrocq got mad himself. "But I had to wait a few years before I could digest what had really happened and why they attacked us," he says. "I, of course, grew up to have nothing but contempt for Osama bin Laden." Yet he adds the episode "motivated me to get a better handle on the world and to want to help improve the world." It also made Dubrocq, who wants to study international business, more aware of his multinational roots  he's French and Cuban on his father's side and Spanish and Mexican on his mother's. Not surprisingly, he also wants to learn other languages, like Chinese and, in an echo of his 9/11 memories, perhaps even Arabic. Williams says she also hated bin Laden more as she grew up and gained a better appreciation of how fanatics had changed her world on 9/11. "All that just because he wanted to control everybody in the world, control how we think and what we do," she says. Williams doesn't plan to pursue a military career  she wants to be a veterinarian  but the military-academy student was impressed by the Navy Seal raid in Pakistan that killed bin Laden: "I was shocked. I thought after 10 years, they'd never find him. But what the SEALs did, it, like, gives me even more respect for that kind of training." Guerrero, in fact, may as well be part of that training. She also plans a civilian life  she hopes to study art and musical theater  but she's a Junior ROTC member and part of her school's state champion Raiders team, which competes against other academies in contests like rope-bridge races, map navigation and marksmanship. In other words, the same sort of skills the Seal commandos have to master. She admits to feeling an added rush when she woke up to Monday morning's news: the Seals' operation, she says, "was very, very cool." More than cool, Guerrero adds, it was also "so reassuring, after a whole decade of being scared about these things." Most of all, it "brought back a flood of memories" of their tragic morning with a President  memories that prove kids can carry a lot heavier stuff in those plastic backpacks than adults often realize. See a portrait of a heroic 9/11 firefighter. See TIME's full coverage of Osama bin Laden's death.